Medium-size fountain pen with plunger filling mechanism, differential piston-filled ink system and hand-crafted finely engraved 14k /585 gold nib with rhodium plating to match the rhodium plating of the barrel and cap trims. Features Pelikan's classic blue striped barrel and rhodium-plated trim. The Pelikan Souverän series represents the highest quality in writing instrument manufacture using only the best materials available. All models feature Pelikan's unique differential piston filling system to ensure a large ink capacity with a visible indication of ink level via the translucent barrel (or portion of the barrel in the case of all black pens). 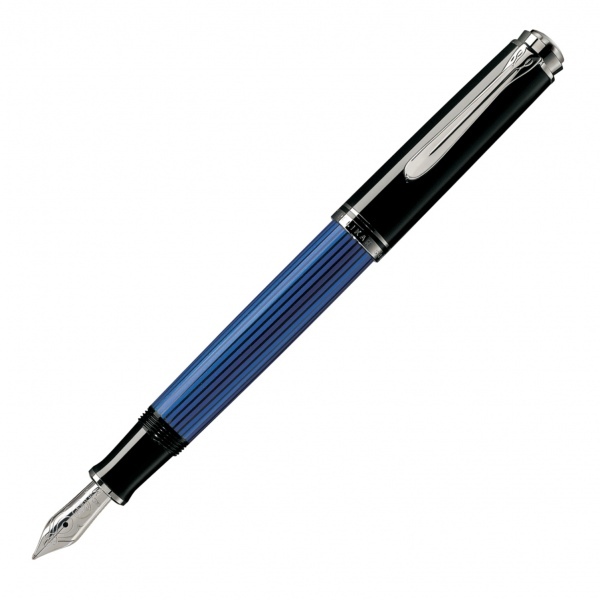 All models are available with the hallmark striped celluloid overlay that has been associated with Pelikan fountain pens for half a century.